National Assembly Chairwoman Nguyen Thi Kim Ngan said she believes that the new country director of United Nations Development Program (UNDP) in Việt Nam would make positive contributions to elevating the relations between Viet Nam and the UN to a new height. 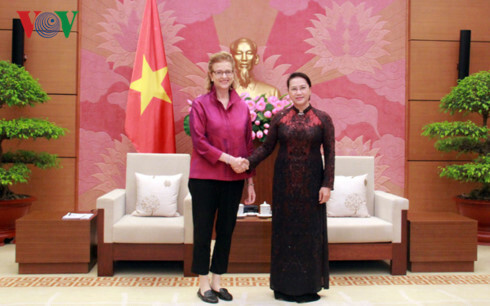 The top legislator expressed the aspiration on November 8 in Ha Noi while receiving Ms. Caitlin Wiesen, the new UNDP Country Director in Viet Nam. Ms. Ngan hoped that thanks to over 25 years of experience gained through various important positions, the new Director would contribute to lifting the Viet Nam-UN cooperation to a new level. The host leader praised the UN and UNDP’s support to Viet Nam’s socio-economic development, particularly in poverty reduction, HIV/AIDS fight, child care and protection, disease and natural disaster prevention and control, climate change response, administrative reform, and improving Viet Nam’s integration capacity. Chairwoman Ngan also lauded the UNDP’s strong cooperation with the Vietnamese NA over the past 20 years, which has focused on improving parliamentarians’ lawmaking and supervisory capacity and skills. The host leader hoped that the international body would continue to provide technical support for the local parliament to improve the legislative capacity, supervise the implementation of the 2030 Agenda for Sustainable Development, respond to climate change, and socio-economic development issues. In return, Ms. Caitlin Wiesen praised Viet Nam for its active and responsible contribution to Green One UN House in Viet Nam. The UNDP said the Country Director has finalized translation of a toolkit on assessment of the implementation of Sustainable Development Goals for Inter-Parliamentary Union (IPU) members. The host leader hoped that the Vietnamese National Assembly would introduce it to lawmakers and relevant agencies to provide information about Sustainable Development Goals, the action framework and parliaments’ engagement to promote the realization of these Goals.